Sim Pooh Ho has been learning wushu since 6. His first master was the Shaolin monk Long Ying Shang Ren. He has been professionally teaching Health and Self-Defence since the 60s. In 1964, on the eve of Singapore’s independence, he founded Nam Wah Pai, specializing in Shaolin wushu. In 1978 he founded the Singapore Martial Arts Instructors Association (SMAIA) and was its elected President for a decade. The SMAIA brought together instructors and masters from the huge range of Martial Arts practices in Singapore – Chinese, Japanese, Korean, Indian, Indonesian and Western. 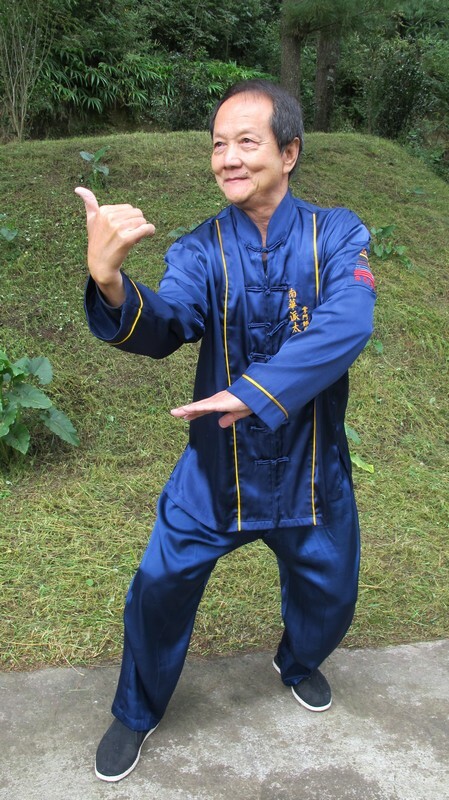 Meanwhile, always seeking to improve himself, Grandmaster Sim had sought further training under the renowned Taiji master Wu Tu Nan in Beijing. This was in the days when China was still reluctant to allow many foreigners in. He was accepted by Wu Tu Nan to be one of his inner chamber disciples in 1978. Wu Tu Nan had only three complete lineage-holder disciples1, and Grandmaster Sim is one of them. With hard work and guidance he managed to transcend his ‘hard’ martial training of the previous years and switch to the ‘soft’ but more powerful skills of Taijigong Health and Self-Defence. In 1986 Grandmaster Sim was awarded the Gold Belt 10th Dan for his mastery and contributions to the world of Martial Arts. This was jointly conferred by the Singapore Karate Federation, Judo Federation, Malay Silat Federation, Indian Martial Arts Federation and Tae Kwon-Do Federation. In the same year he was awarded the P.B.M2 by the President of Singapore for his contributions. One of Grandmaster Sim’s most valuable contributions to Taiji practice is the creation of a systematic and progressive training. Due to various social and cultural conditions of the past, coupled with the difficulties of this art, systematic training for normal students of Taiji was lacking. Only students with lots of talent and with loads of time could eventually become experts in Taiji practice. But Sim Pooh Ho drew from his experience of teaching Chinese Wushu, and also from the methodical teachings of his teacher Wu Tu Nan to craft a step-by-step approach that allowed normal and busy people to learn and progress without having to dilute the contents. He has since traveled and taught Taiji to students in various countries including Chile, Argentina, Taiwan and Malaysia, establishing Nam Wah Pai branches and associations in each of them. In Oct 2005, Grandmaster Sim left the Singapore Nam Wah Pai Institute of Art of Self-Defence which he originally founded 42 years ago. Together with his disciples who are interested in practicing the undiluted legacy of Taijigong, he established the World Nam Wah Taijigong Association. In the early 21st century, he moved to the mountains in Kunming, Southwestern China, where he continues to pursue the highest levels of Taiji Gong. From Kunming, he continues to oversee the progress of his Taijigong disciples from the Nam Wah establishments in China, Chile, Argentina, Taiwan, Malaysia and the Association in Singapore. © All rights reserved Sim Pern Yiau. 1 Ma You Ching, Sim Pooh Ho and Li Lian. Officially Li Lian’s master is Ma You Ching, and indeed on Wu Tu Nan’s tombstone Li Lian is listed as grand-disciple. However Li Lian had a lot of direct teaching from Wu Tu Nan, and was in effect also a direct disciple.